Rediff.com » Cricket » First Look: Tendulkar's remarkable story in his own words! 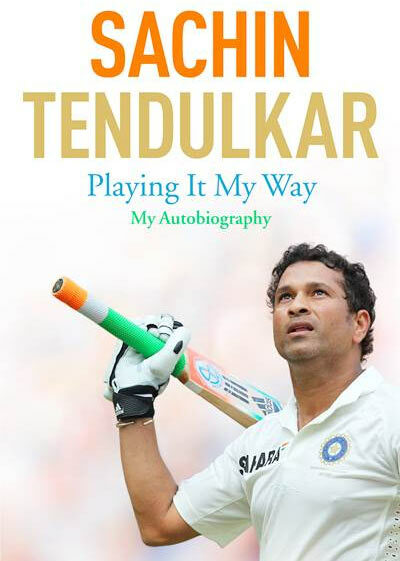 First Look: Tendulkar's remarkable story in his own words! Sachin Tendulkar, the highest run-scorer in the history of international cricket, retired in 2013 after playing for an astonishing 24 years. The most celebrated Indian cricketer of all-time, he was conferred the Bharat Ratna, India’s highest civilian award, on the day of his retirement. Now, the batting icon tells his own remarkable story. For the first time he provides a fascinating insight into his personal life and gives a frank and revealing account of a sporting life like no other in Playing It My Way – My Autobiography. From playing in the bylanes of suburban Mumbai, to his first Test cap at the age of 16 to his 100th international century and the emotional final farewell that brought his country to a standstill, it’s all there in his book, to be released in November. “I knew that agreeing to write my story would need me to be completely honest, as that’s the way I have always played the game. It would require talking about a number of aspects I have not shared in public before. “So here I am, at the end of my final innings, having taken that last walk back to the pavilion, ready to recount as many incidents as I can remember since first picking up a cricket bat as a child in Mumbai thirty-five years ago,” said Tendulkar about his new book. British publishing house Hodder & Stoughton editor Roddy Bloomfield says, "Over the past twenty-five years Sachin Tendulkar’s colossal batting triumphs for India have singled him out as one of the greatest players in cricket history. He is universally admired and respected and most impressively remains a very modest man. The book will be simultaneously released all over the world and in India will be represented by Hachette India. Image: Jacket of the book, Playing It My Way – My Autobiography.